It's become kind of a "thing" for me to write a post outlining my monthly chores and a couple of tips for the garden, especially during these very important spring months. The month of May is here, and although spring has been a bit coy with us so far my beds are full of hyacinths, daffodils, tulips, and many other spring blooms. I know, I know, everyone writes these posts, but I not only write them for my readers I also write them to keep myself organized and up to speed on what I need to accomplish each month. Like I said, these spring months are very important when it comes to our gardens, the more we do now the more we'll be able to enjoy in the summer months. All of that said, read on if you'd like to hear about some of what I'm doing in the garden this month. All beds should be cleaned of debris, edged, weeded, and mulched by months end. As early blooming perennials fade, you can dig, divide, and transplant them. Begin mowing, and for best results consult this site for grass height recommendations. Moisten and turn that compost pile if you have one. 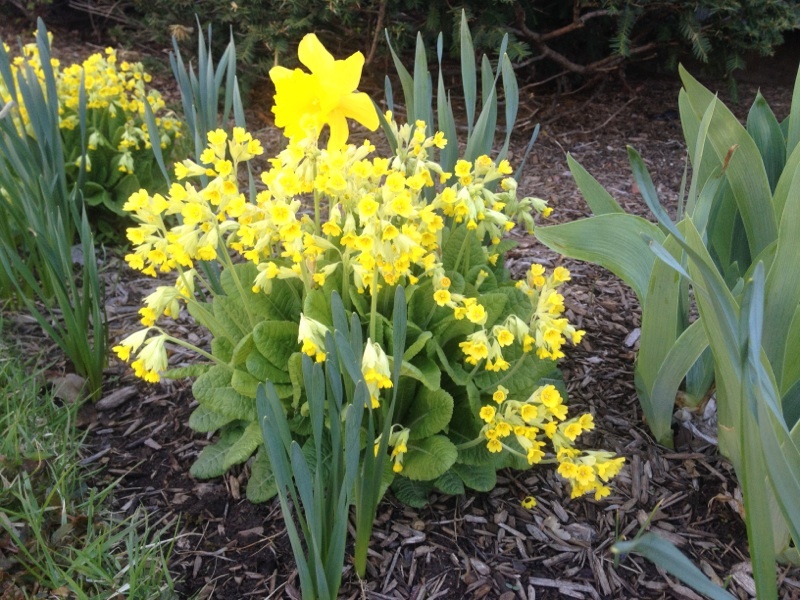 Deadhead spring blooming bulbs, but leave the foliage until it turns yellow for the bulb to feed on. Be sure all dead, diseased, or weak braches, as well as any "suckers" or crossing branches that you see. Prune back your early spring flowering bushes when the blooms fade. Keep up on "pinching back" your late summer and fall blooming perennials. Plant summer annuals after the threat of frost hast past. Visit here to look up your last frost dates with your zip code. Finish overseeding, and seeding bare spots in your lawn. You can sow hardy vegetables directly in your garden soil, but be sure to harden off your other vegetables until months end. So there you have it, just a few things I'm doing this month that will hopefully make my blooms bigger and my life a little easier this summer. If you have some tips or trick for me I'd love to hear about them, anything to make my life in the garden easier! This entry was posted in Birds, DIY, Gardening Tips, Homeowner, Indoor Gardening, Landscaping and tagged Compost, FAQs Help and Tutorials, Garden, garden applications, Home, Perennial plant, Plant, Seed, TUFF GUARD The Perfect Garden Hose, Twitter. Bookmark the permalink.